Pulehunui is an ahupuaʻa in central Maui; it extends from the peak of Kilohana on the rim of the crater of Haleakala, at an altitude of 10,000 feet, in a nearly west direction for about fifteen miles. The eastern or mountain portion is comparatively narrow, often less than half a mile wide. Where sufficient water was not available for irrigation (from rivers or springs,) then dryland farming took place; ʻuala (sweet potato) was the primary crop in those regions. The early Polynesians brought sugar cane with them and demonstrated that it could be grown successfully in the islands. The first commercially-viable sugar plantation, Ladd and Co., was started at Kōloa on Kaua‘i in 1835. Others followed, including on Maui. On June 15, 1938, a few hundred acres of land at Pulehunui was set aside for a Maui Airport; it was opened on June 30, 1939 (the new Maui Airport replaced a smaller airfield at Māʻalaea.) Inter-Island Airways, Ltd (to be later known as Hawaiian Air) constructed airport station improvements. Immediately after December 7, 1941 Pearl Harbor attack, the military took control of all air fields in the Territory and began the expansion of Maui Airport at Pulehunui. An expansion lengthened and widened the runways. Under Navy control, the facility was renamed Naval Air Station Puʻunene, the airport served as a principal carrier plane training base. By the end of the war, Puʻunene had a total complement of over 3,300-personnel and 271-aircraft. A total of 106-squadrons and carrier air groups passed through during WW II. Following the war, the Territory took back various airfields and converted them back into full-scale commercial operation of airports. 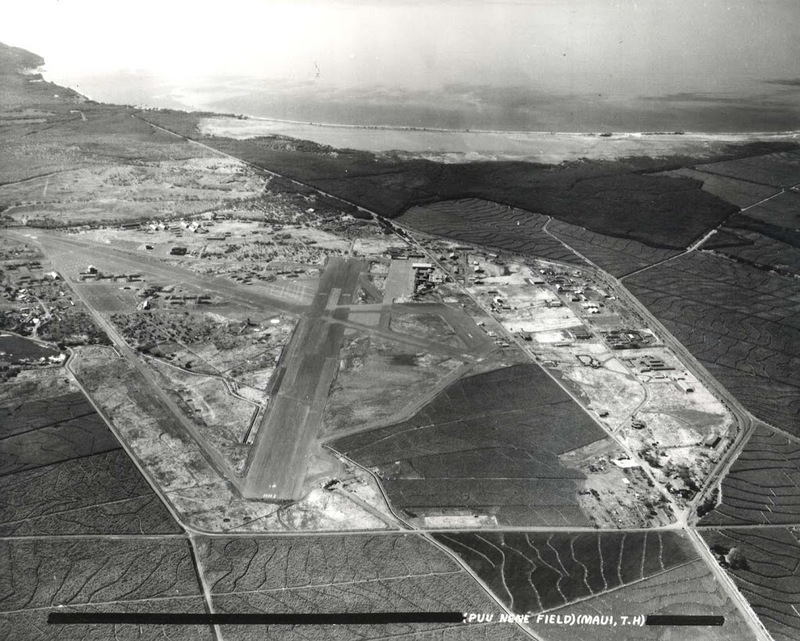 In December 1948, the Navy declared the Puʻunene Airport land surplus to their needs and the airport reverted to the Territory under Quitclaim Deed from the US Government. It was later abandoned and the old runway was used for drag races and time trials in May 1956; it remains in use as Maui Raceway Park as an automobile “drag strip” and park for such activities as go-kart racing and model airplane flying. Other uses of the former site include the Maui Regional Public Safety Complex and prison facility to alleviate overcrowding at the existing 7-acre Maui Community Correctional Center facility in Wailuku.